Ready to get your kids school paperwork sorted once and for all? You’re in the right place! 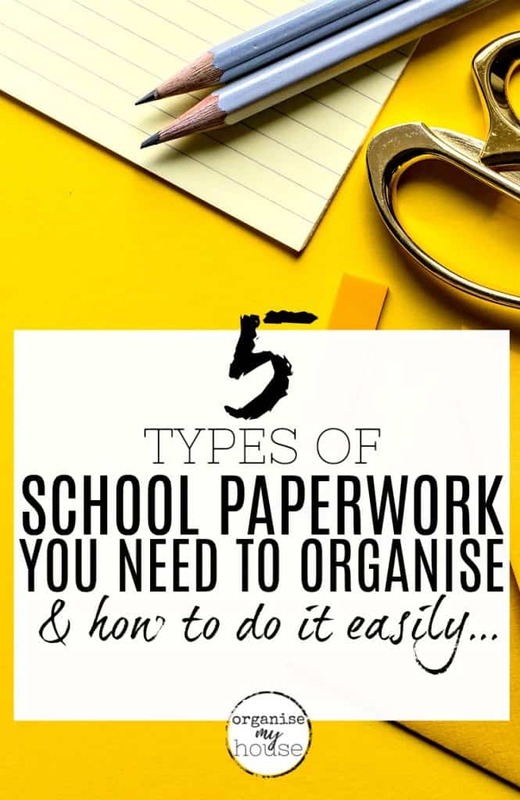 Here are the 5 main types of school paperwork to make sure you organise well, and tips / inspiration on how to make that as simple as possible. Enjoy! School paperwork – it breeds – I’m sure of it! – there are always letters, homework and projects coming home, and because of this, there’s most definitely a HUGE need to keep it under control as much as possible. After all – you want to keep memories of your kids school years, AND you need to keep the current years paperwork in order so you can find it all. The question is – how do you do this easily, so you don’t lose yourself under those paper piles? So – let’s get started, shall we! 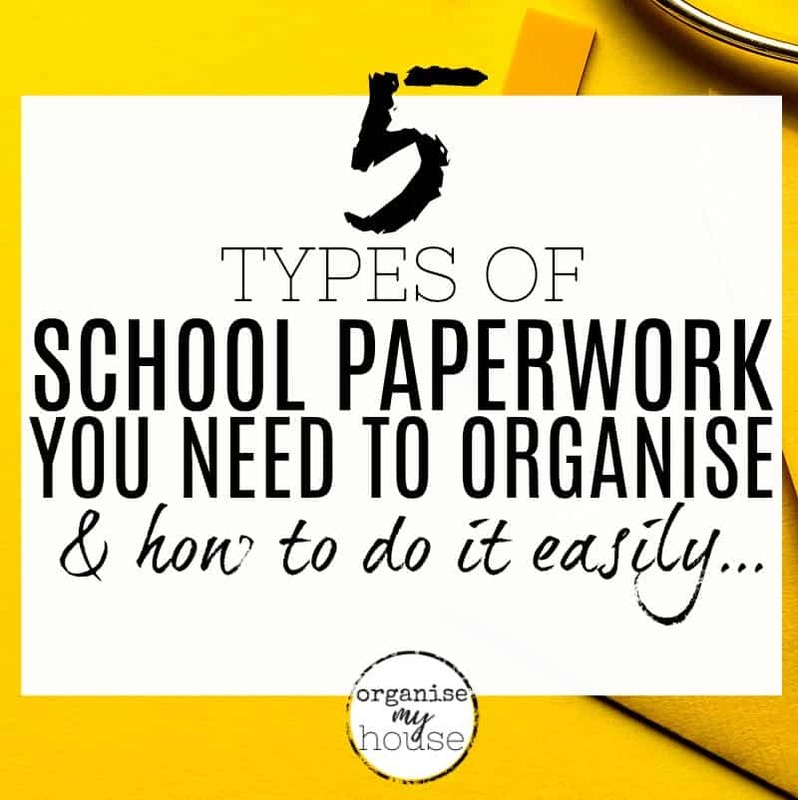 What I’ve done is look at each TYPE of school paperwork that could come into your home from school – and then given ideas of how to organise it. I hope it helps you finally take control of that paper clutter…. There’s a constant dialogue with school, whether it be forms to fill in and send back or letters with specific items in – there’s got to be a simple way to deal with them so that they don’t get lost and deadlines aren’t missed. Get your child to put any paperwork from school into this file each day, and then take it out of their bags when they get home so you can quickly sort through it. Sort through when you have time each day (I usually look at this straight away as then it’s done and dusted, and I have time to sort anything that needs extra time spent). Add any paperwork back into the folder ready for your child(ren) to give to the teacher when they get to school the next day. This obviously means that your child needs to take responsibility for both filling the file AND delivering any forms/letters back to school – but this is a good thing to get them to do as it teaches them to start to be a little independent from an early age. TIP – If your child forgets to look in the file and give letters/forms back to the teacher, then think about how to get them to definitely look in that file each day. Firstly – use a transparent file so it’s easy to see that there’s stuff in it, and secondly, if they have snack/dinner money or anything else they use each day, then add that to the file so they start to get used to looking in there regularly. Homework may be a once a week thing, or a daily thing – depending on your childs school and age. Whatever the case, it will need to be handled like letters were – in a folder thats large enough to keep it altogether easily, and so they don’t lose anything. When your child comes home, they can simply put the homework into a place that’s been set up for it – so that they can grab it when they have time to do the work – and so you can see what they have as well. This place could be a homework station that you’ve got set up with all the items they may need for doing the work as well, or a simple tray, or an inbox similar to something you use for your own incoming mail and paperwork. TIP – If they have lots of homework, then have a second tray/file for Homework that’s done and ready to take back to school so that they are kept separate but organised well. School will send lots of general information about the school year, teachers, the school day, uniform, extra classes etc… – and you’ll also have out of school activity information to deal with. For all this information I suggest setting up a SCHOOL FILE. Nothing fancy – I just use a simple ring binder for my daughter – and have a section for each school year. I then add in all the information I need to keep track of. The easiest way to organise this is to have one for each child, and add into it everything that they have related to school that you may need to refer back to. WHAT DO I KEEP IN OUR SCHOOL FILE? School information – I have a tab for each school year and add the latest year to the front so it’s easy to see. Any letters / bills etc… related to her classes. Back to school planner. I created this a few years ago as I wanted to have specific printables in the school file for things like my back to school checklist, school information, and a page for memories of each school year (I’ve made UK versions as well as US versions so don’t worry if you need one or the other – you’re covered!). I LOVE filling this in each year, and it helps to keep things really organised – with ease!. You can grab a copy HERE so you don’t have to spend time creating your own. HOW LONG DO I KEEP THINGS FOR? Of course – the current school years section is by far the largest – as it should house all the information needed. For previous years I simply declutter anything that isn’t needed at the end of that school year – so I only have things that are specific memories and keepsakes. The idea is that this school file will go into their memory box when they’ve finished school (it may be that I do one for primary and one for secondary school) – and will be a lovely keepsake for them without taking up too much room. Alongside all the information from school that can be kept in the SCHOOL FILE, there will of course be lots of school work and projects that they bring home when finished. This normally comes home in bulk at the end of the year, but things like artwork can be a regular offering! Artwork can be hung on the wall each week – so they they get the enjoyment of changing it and creating new things for you. How many you hang is up to you – I hang one on a clipboard in our kitchen which has always worked really well, but a friend of mine had a huge noticeboard that she filled with art and crafts from her daughters and regularly changed. If you have the space (or lots of kids!) then this is a great idea, but work out what suits you best and go with that. Once artwork has been displayed, instead of keeping it as it is – I take a photo or scan it – and then I have a digital copy that’s safe on the computer, and use this for our yearly photo book as well. This keeps paper clutter to a minimum, and preserves the memory of the art (you can find that art will deteriorate over the years if you try and keep it). School books and projects will be sent home when finished with – and are obviously multiple AND bulky to keep. As such, I keep a minimum while still preserving the memories by going through the books and keeping just some specific pieces of work that are funny / have a specific memory to them / show progress etc…. I also scan/take a photo of these to use in our photo book at the end of the year, OR add the actual pages to the SCHOOL FILE. Last but definitely not least are school photos. Usually you get a set of photos each year, and it can be hard to know what to do with them all! Have a school photo on the wall somewhere in your home, and swap it out each year for the latest one. If you have the room, you may want to display a small photo of each school year altogether, so you can see how they’ve grown! Send a photo to grandparents / godparents etc…. – I like to do this in their Christmas Cards as we get the photos around that time of year. Keep one photo in the SCHOOL FILE, and if you have the Back to School Planner then there’s a space on each school years page to add the photo which makes a lovely keepsake. Get a digital copy – OR take a photo/scan a photo so you have a digital copy for your photo book and on your computer as well. … and now you have simple ideas and tips for how to keep them all under control once and for all. A SCANNED/PHOTO of art/work that you want to keep so you have a digital copy of everything that’s special to you. If you can set up these in your own home, then school paperwork will be SO easy to deal with – and you won’t look back!. I hope it helps you keep things under control, and that your children have a great school year this year! Previous Post: « 4 SIMPLE QUESTIONS THAT WILL MAKE DECLUTTERING EASIER THAN EVER BEFORE!